The calendar features this image titled 'What you looking at?' was submitted by Emma Reid. A special calendar featuring agricultural images taken by farmers across the north and north-east is now available to buy from ANM Group. The north-east farmers’ co-operative has produced the calendar to raise funds for two local charities – Northsound Cash for Kids and the Royal Northern Countryside Initiative. 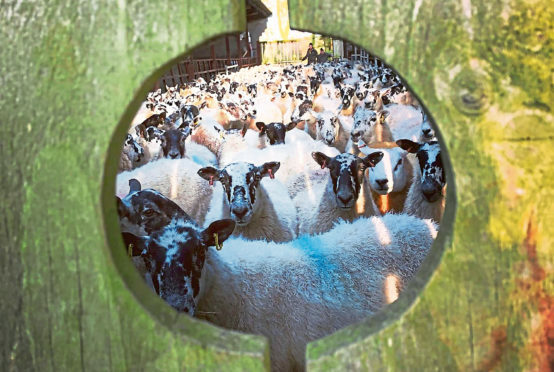 ANM Group chief executive Grant Rogerson said the calendar features 13 photos taken by members, customers and farming enthusiasts from across the region. These include a striking image of a pen of sheep, pictured on the right. It follows a four-month social media photo competition where more than 300 entries were submitted. “Our sincere thanks and appreciation to all members and customers for participating in ANM’s social media photo competition,” said Mr Rogerson. “All proceeds from the sale will go directly to two great local charities selected by our charity committee. Copies of the calendar cost £8 each. They are available to buy at the Thainstone Centre, Inverurie, or online by sending an email to marketing@anmgroup.co.uk.